The Tlaxcalan mercenaries are considered high status troops amongst the Tlaxcala. They are highly trained indigenous warriors who can wield their clubs with great skill and are often used as shock troops. 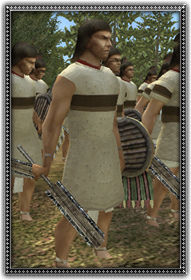 These troops wear padded armour called ichcahuipilli, and use a chimalli shield and a maquahuitl club.